c.) You have thoroughly enjoyed the movie The Great Mouse Detective at any point in time! Basil of Baker Street , as you might have guessed, is the book which the Disney movie is based off of and it's a real treat! Certainly some details have been changed, but the essence of the story remains very much intact. I was able to enjoy the book by itself and enjoy the movie as something the book was "based on." The book has a timeless quality to it. Originally published in 1958, Eve Titus wrote this book in order to entice children to love mysteries and intrigue them from an early age with the character of Sherlock Holmes. She does this by created the character of Basil, who is a mouse "under the study" of the great Sherlock Holmes. Only, as it turns out, Sherlock Holmes has no idea he has an apprentice. Basil prides himself on having learned a great deal from this famous detective by careful observation. Basil then represents Sherlock Holmes to the mouse world. "May I offer you my heart-felt congratulations. It is a simply wonderful creation, and I can assure you that my father would have revelled in every page." If that's not an endorsement, I'm not sure what is! 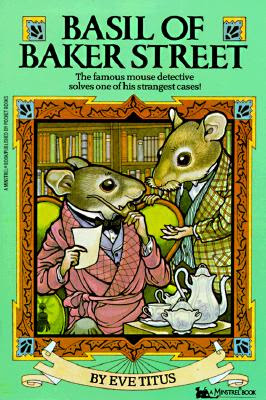 In Basil of Baker Street , Basil is called upon to solve the mystery of a kidnapping of two twin mice. He discovers that the lowly masterminds behind the kidnapping plot involve the "Terrible Three" and their scheme involves more than simply collecting a ransom. Basil and his sidekick, Dr. Dawson, set out to find the kidnappers and stop the evil plans set in motion by the Terrible Three. Will Basil be successful!? Well, given the fact that four sequels were written following this book, I think its safe to assume that Basil wins his case. PERFECT book for boys ages 8-10 most definitely. I'm delighted with this book and will be looking for the others in the series. Tasteful, enjoyable, fun and in the spirit of Sherlock Holmes himself. It isn't hard to see why Disney would have picked up this book and wanted to capitalize on it. It is definitely a winner and if you can find a copy - GRAB IT! I can't think that you'd be remotely disappointed. Basil of Baker Street (1958): Basil and Dawson go searching for the missing twin children of Mr. and Mrs. Proudfoot. The search takes them from Baker Street to a harbor, and even to the countryside of England. Basil and the Lost Colony (1964): Basil leads an expedition in search of the Lost Colony of the Tellmice. Along the way he is pursued by Ratigan and his thugs. Basil and the Pygmy Cats (1971): Basil finds a clue that hints at the existence of Pygmy Cats. He and Dawson search for the truth, all the while avoiding Professor Ratigan and Captain Doran. Before they can even go searching, however, they must restore the Maharajah of Bengistan to his throne. Basil in Mexico (1976): About to embark on a trip to Mexico to help out with a case there, Basil is suddenly called upon to solve the Case of the Counterfeit Cheese. Then, upon his arrival in Mexico, he discovers that that famed "mousterpiece", the Mousa Lisa, is missing, and that it is up to him to find the culprit. Almost immediately afterwards, Dr. Dawson is kidnapped. Basil in the Wild West (1982): Basil and Dawson continue their North American adventures by solving two mysteries in the Wild West. First, they have to stop a gang of smugglers from taking control of part of the West, and then solve the mystery of the "Thing" that is scaring guests of the Hathaway Hotel. So nice to see someone else review this book. I read all of these when I was a kid and happened upon this at a thrift shop a while back and read to my son. I've never seen the movie! I want to find all these! I haven't read them but I know I would love them. What a fun way to start into Sherlock! I forgot all about The Great Mouse Detective. I'm going to have to look for these books - I bet we'd love them. Sounds cute! And since I have a mystery loving boy almost in that age range I'm going to request it from my library right now! this sounds like a very cute children's series. I love children's books. I guess that's the teacher's heart in me. Well, I hope you all DO read it, of course! =D I think you'll really like it. The movie, fyi, is kind of scary for youngsters. I probably won't show it to my boys until they are 6-7. The movie takes place on a "dark and stormy night" so the scenes are dark (only because of time of day) but Rattigan has this sidekick that is a peg-legged bat. The bat has kind of a scary face and he pops into scenes at unexpected moments, making scary faces. Or. At least, he scared ME when *I* was little and so I'm sensitive to letting my kids watch it too soon. I think it's mostly the dark screen that makes everything so scary but the story itself is clean and fun.